This article is about the Friends character. For the Scala character, see Andrea (Scala). Andrea is a Friends mini-doll figure introduced in 2012. 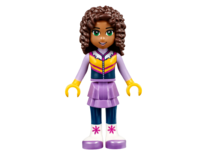 She is one of the five main characters of the theme and one of the four deuteragonists of the television series LEGO Friends of Heartlake City, appearing in all seven episodes. She is the musical girl of the group of friends. She currently appears in eighteen sets and she has fifteen variations between them. Andrea also appears in thirty-seven of the forty-eight Friends webisodes. Andrea has thirteen variations, all of which have the same hair and face. Andrea's where originally earth green but in 2013 they where later switched to bright green. Andrea has medium nougat skin. Her eyes are currently bright green in colour. She has a curved black eyebrow over each one of her eyes. She has a open smile showing her white teeth. Her mouth is outlined in light purple lipstick. Like all of the female mini-doll figures, Andrea has a button nose in the centre of her head. Her hairpiece depicts dark brown, vibrantly curled hair. There are two holes in her hairpiece one on the top and one on the right to hold bows and other accessories like crowns and sunglasses. All her variations but one feature her with medium nougat arms, legs and hands. In 3061 City Park Cafe, 30100 Andrea at the Beach and 30107 Birthday Party she wears a flame yellowish orange top. It is decorated with bright reddish violet music notes in the centre. There are three small cool yellow circles in the left top corner, and three slightly larger ones in the bottom right corner. She wears a double layered aqua skirt and bright reddish violet coloured shoes and anklets. Her variation in 3932 Andrea's Stage she is wearing a bright yellowish green halter top. In the bottom right corner, there's two earth green music notes over a swirl of spring yellowish green. In the top left hand corner there is earth green butterfly. She wears the top with white cropped trousers with a medium lavender flower printed in the bottom left corner. She wears light purple sandals on her feet. In 3938 Andrea's Bunny House she once again wears her bright yellowish green halter top. In the bottom right corner, there's two earth green music notes over a swirl of spring yellow green. In the top left hand corner there is earth green butterfly. This time she wears it with her double layered aqua skirt and bright reddish violet coloured shoes and anklets. In 41008 Heartlake City Pool, she wears a medium azure bikini top. There are white tropical white flowers and music notes printed on the top. The rest of her torso is medium nougat besides the dark brown navel. She also wears cool yellow swimming trucks and bright reddish violet and cool yellow sandals. In 41009 Andrea's Bedroom she wears a plain white torso that has a bright reddish violet necklace of musical notes on it. She wears a doubled layered flame yellowish orange skirt and bright reddish violet coloured ballet shoes. In 41035 Heartlake Juice Bar she wears the same skirt and shoes as she previously did in her bedroom, a double layered flame yellowish orange skirt and bright reddish violet coloured ballet shoes. She wears a bright reddish violet halter top that has a light purple tropical flower print in the bottom right corner. In 30114 Andrea's Beach Lounge she is in her beach gear. She wears a bright reddish violet and white striped bikini top. The rest of her torso is medium nougat besides her dark brown navel. She combines it with cool yellow swimming trunks and bright reddish violet and cool yellow sandals. In 41031 Andrea's Mountain Hut she is wearing a medium azure blue halter top. It has a white floral pattern in the bottom left corner. The top has a white cross in the centre and around the neck. She wears the top with cropped bright reddish violet trousers and bright reddish violet and white striped shoes. In 41038 Jungle Rescue Base Andrea is in her jungle wear. She wears a light purple shirt, with a brick yellow ascot at the top. There is also two brick yellow pockets in the bottom corners. There's a black zip going down the centre of her torso, all the brick yellow sections are outlined in black too. To the right of the ascot the jungle rescue logo is printed in bright reddish violet. She also wears brick yellow shorts and brick yellow and bright reddish violet striped shoes. In 41097 Heartlake Hot Air Balloon Andrea wears her regular flame yellowish orange shirt. It is decorated with bright reddish violet music notes in the centre. There are three small cool yellow circles in the left top corner, and three slightly larger ones in the bottom right corner. She wears bright yellowish green shorts and bright yellowish green and bright reddish violet striped shoes. In 41101 Heartlake Grand Hotel she once again wears a white torso that has a bright reddish violet necklace of musical notes on it. She wears the top with her brick yellow shorts and brick yellow and magenta striped shoes. In 41102 Advent Calendar she wears an earth blue jumper. The jumper starts out earth blue, in between the top and second quarter there's a white line. Under white line, there's white triangular shapes with bright red stars inside of them. Theres a further white line underneath that. The bottom half of torso is white besides from a bright red stripe at the top. She combines the jumper with a flat triangular bright red skirt, earth blue tights, and bright red boots with white fake fur at the top. In 41105 Pop Star Show Stage she is wearing a pop star outfit. She is wearing a bright reddish violet top which has a triangular neckline outlined in flame yellowish orange. The bottom of the top has various triangular shapes in flame yellowish orange and silver metallic. Her skirt is flame yellowish orange and is swept to the right. At the end of the skirt there's a bright reddish violet trim. Andrea wears silver metallic coloured shoes. In 41121 Adventure Camp Rafting Andrea is dressed for camp activities. She wears a bright reddish violet singlet top, with a v-neckline. The front of the top has various flame yellowish orange and cool yellow arrows pointing downwards. She wears the top with her brick yellow shorts and brick yellow and magenta striped shoes. Andrea is wearing a causal pop star outfit in 41135 Livi's Pop Star House . She wears an aqua top, with a frilly bright reddish violet jacket over it. There's various warm gold buttons in the top corners of the jacket. She completes the outfit with her double layered aqua skirt and bright reddish violet coloured shoes and anklets. Andrea has ten different animated appearances. Her regular has an extremely similar appearance as in 3061 City Park Cafe, 30100 Andrea at the Beach and 30107 Birthday Party, but it is more humanistic. Her top is now bright yellow in colour. She also wears a bright yellow music note hair clip in the left side of her hair. Andrea's second variation portrays her in a metallic dark grey dress. It has an additional layer at the bottom. Her third variation is the same as her variation from 41008 Heartlake City Pool. She occasionally wears flame yellowish orange sunglasses with this outfit. Her fourth variation is based of her appearance from 41035 Heartlake Juice Bar. The only difference is her skirt is now dark orange. Her fifth and first original outfit is a fruit dress. It is bright purple at the top with bright red dots at the bottom. The skirt is bright green with several earth green diagonal lines. There's a spring yellowish green downwards facing arrow between the skirt and top. She wears a flame yellowish orange sunflower in the right side of her hair. Her sixth outfit recreates her jungle rescue appearance as seen in 41038 Jungle Rescue Base. She additionally wears a lavender rucksack with earth green straps on her back. Her seventh outfit portrays get wearing a bright yellow dress. The dress is tied with a bright reddish violet band around the waist line. She wears a bright reddish violet flower in the right of her hair. In her eight outfit she's wearing her regular bright yellow top again. She wears a short sleeved open bright yellow jacket over the top. She wears long earth blue trousers tied at the top with a reddish violet belt. On her feet she dawns bright reddish violet shoes. Her next outfit shows her in a medium length bright red dress. She wears it with black shoes and a medium lilac flower in her hair. Her tenth outfit shows her in a black dress. The dress is metallic black at the top but black at the bottom. Like her metallic dark grey dress, it has an additional layer at the bottom. She wears the black dress with black shoes and anklets. In eleventh outfit she is in her jogger get up. In her hair she wears a medium azure music note accessory. In her ears she wears white earphones. Andrea wears a light purple tank top. She also wears bright reddish violet shorts with a white diagonal stripe going through the right and left sides. She wears bright reddish violet and white sneakers on her feet. Andrea's following appearance shows her in her Science Camp outfit. Andrea wears medium bright yellow v-neck, that has sleeves and a neckline outlined in light purple. In the top right corner of her top there's six white strands of D.N.A. surrounding a bright red atom. Emma wears brick yellow shorts and trainers. Andrea's thirteenth outfit recreates her outfit from 41008 Andrea's Bedroom. 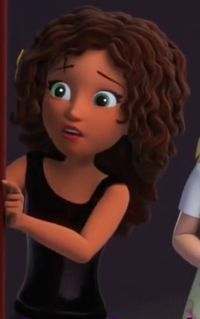 Andrea has thirteen webisode variants, similar to LEGO Friends of Heartlake City she is designed to look like a human. This time she is 2D animated compared to CGI. 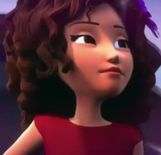 Her regular appearance is almost identical to her regular appearance in LEGO Friends of Heartlake City. But the bright yellow music note hair clip is now on the right side of her hair. Her second webisode variation is similar to her appearance in 41035 Heartlake Juice Bar. She wears the same skirt and shoes, a layered flame yellow orange skirt and bright reddish violet coloured ballet shoes. She also wears a bright reddish violet halter top, but there is now bright yellowish green circles printed on it. She wears a white apron with a green outline around her neck, the juice bar logo is printed at the top of her apron. Her third variation is based off her appearance from 41008 Heartlake City Pool. Her fourth variation is based off her appearance from 41038 Jungle Rescue Base. She now wears bright purple shoes tied with white laces. She also has a bright reddish violet tropical flower in the left of her hair. Her fifth variation is a pink variation of her jungle rescue outfit. It is the same as her previous jungle outfit except what used to be brick yellow is now dyed bright reddish violet. Her sixth variation is based off her appearance from 41031 Andrea's Mountain Hut. Her seventh variation portrays her in a disguise of Olivia. She wears a medium lavender hair band in her hair. Andrea wears a medium lavender short skirt. She also wears light purple ballet shoes. She wears a bright purple top with a large white outline to create a heart shape. There are three smaller hearts surrounding it, one white heart to the left and two lavender hearts to the right. In her hair she wears a bright purple hairband. Andrea's eight outfit shows her in her pyjamas. She wears an aqua top striped with bright reddish violet lines. She wears baggy flame yellowish orange trousers and sand blue slippers. Andrea's ninth outfit is her disguised as an older woman. She wears an earth blue floppy hat with a light pink flower on it. She wears flame yellowish orange sunglasses to hide her eyes. She wears a long earth blue dress, white gloves and a white pearl necklace around her neck. Andrea's tenth outfit is based off her appearance from 41105 Pop Star Show Stage. Like her regular variation she has a bright yellow music note hair clip on the right side of her hair. The eleventh outfit she wears is the same as 41097 Heartlake Hot Air Balloon, but like her regular variation her top is now bright yellow. Andrea's twelfth variation recreates her appearance from 41101 Heartlake Grand Hotel. For her thirteenth variation, Andrea wears a medium lilac sombrero, which is light stone grey on the inside. Andrea wears a sleeved medium lilac jacket. There are two light stone grey lines going down through the sides of the torso. To the bottom sides of the lines, there are several light stone grey squares and rectangles. Andrea wears a bright red bow tie around her neck. Under the bow tie, there are various white and bright yellow badges. Printed at the top part of each sleeve, there is a light stone grey triangle. On the bottom part of each sleeve, there are several different shapes. Andrea's trousers continue on the line going down the centre print from the torso. The side of the legs have various light stone grey buttons. Andrea's regular variation like in the other forms of media is based off her appearance in the sets; 3061 City Park Cafe, 30100 Andrea at the Beach and 30107 Birthday Party. This time instead of wearing an aqua skirt she wears a white skirt. In Andrea's second variation she swaps her skirt for earth blue jeans, that have light purple hearts printed at the top. Andrea wears light purple shoes on her feet. In Andrea's forth variation she wears a white top, layered flame yellowish orange skirt and light purple ballet shoes. In Andrea's fifth variation she once again wears her bikini top. That has white tropical white flowers and music notes printed on the top. The rest of her torso is medium nougat besides the dark brown navel. Andrea wears cool yellow trousers and light purple sandals. Andrea's sixth variation is her dressed up in her rehearsal gear. The top has one strap which is outlined in bright reddish violet. The top is decorated with light stone grey dots in the centre. Near the waistline, there is a bright reddish violet and small spaced out rectangles to the side of it, forming a belt. She wears it with a layered lavender skirt, white tights and light purple shoes and anklets. Andrea's seventh variation is her waitress uniform. Andrea wears a light purplejacket. It has a low neckline, white collar and a single white button. Andrea wears a layered light purple skirt and bright purple shoes and anklets. Her band variation shows her wearing a medium lilac halter top. The top of the top is lined in white. In the bottom right corner, there's two bright yellow music notes. In the top left hand corner there is a bright yellow butterfly. She wears a long earth blue dress, bright yellow shoes and bright yellow anklets. Andrea has one variation in Resort Designer, it has one difference to her regular variation in LEGO Friends:The Video Game. Andrea now wears a medium azure skirt. Andrea is one of the five main characters in the Friends theme and is the singer of the group. Andrea has four best friends, Emma, Mia, Olivia and Stephanie. Andrea uses phrases like "My girls" instead of friends when referring to her best friends. She is also friends with Andrew, Christina, Chloe, Danielle, Ella, Ewa, Isabella, Kate, Katharina, Lily, Lacy, Liza, Livi, Jacob, Julian, Nicole, Noah, Martin, Matthew, Maya, and Robert. 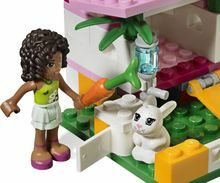 She owns a pet rabbit, Jazz, as displayed in 3938 Andrea's Bunny House who is her first pet ever. She recently found Tony, a chameleon in the jungle and adopted him. Andrea's parents have not appeared in any sets but her Aunt, Susan appears in 41101 Heartlake Grand Hotel. Andrea works at the City Park Café with Marie on Monday nights and Saturday mornings. Andrea sometimes helps out Naya at the juice bar. Andrea likes hanging out at the pool with her best friends and other friends such as Isabella. Andrea loves dancing, writing and composing her own songs, singing and theatre as shown in 3932 Andrea's Stage. Andrea loves eating food and she loved to try new food each week. She also likes cooking as seen in the City Park Café. Andrea likes playing computer games which have not been shown in a set to date, she appears to own a 3DS as she wall shown holding one on LEGO.com. She also owns a laptop where she plays online games with Ewa. Andrea's personality is like her friend's personalities, nice and sweet. She is trying to be less lazy by telling herself "Life's a party and you're invited!". She is also known to be a bit sassy and a drama queen. Andrea was singing at the City Park Café but was upset when she was told by Marie, she had to continue working. Andrea almost got fired when she dropped a hamburger on a customer's head when Scarlett bumped into her. Andrea went to the stables to confront Scarlett's owner, Olivia. Olivia apologised to the Andrea and the other girls about Scarlett and they become friends. Andrea helped Olivia and Emma help look for Scarlett when she runs away. The girls decided to enter Scarlett in the World Petacular. Andrea brought Stephanie to the City Park Café to re bake her cupcakes for the World Petacular. The following day, Andrea helped makeover Scarlett. After Scarlett won Andrea then sang "We can do it" to celebrate the end of the World Petacular". Andrea took part in preparation of Stephanie's birthday party. In order to keep Stephanie unaware of the surprise, she had to lie to her about music practice, when in fact she was engaged in the conspiracy. Andrea and her best friends discussed Stephanie's surprise party at Olivia's Treehouse. After they decided on a location, Andrea thought Emma, Olivia, and Mia the dance routine. Andrea had fun teaching her friends how to dance. Jacob came and Andrea told him to put up the lights for the party. Later Andrea and her best friends minus Stephanie took a picture in the photo booth, for Stephanie's present. The next day Stephanie confronted her best friends at the pool, where the party was being held. The girls told Stephanie that it's a surprise party for her birthday. After they surprised Stephanie, Andrea is then is danced with her best friends. Ms. Stevens arranged for Andrea's class to make a project to protect dolphins, to prevent them from trapping themselves in fishermen's nets. Andrea and her friends suggested putting a radio in the fish nets, with the radio broadcasting the noise of orcas to scare the dolphins, thus sending them swimming away. The team was then rewarded for the project. The five were excited when they were invited on a dolphin cruiser trip as the prize. When the friends are admiring the dolphins, one dolphin gets separated from his mother. Andrea dives into the sea and brings the dolphin back to her mother. When the friends were lost at sea the dolphins returned a favour thanks to Andrea and directed the ship back to Heartlake City. In the next episode Andrea was talking in the juice bar with Emma, Olivia and Stephanie. Mia invited the girls to the sunshine ranch as she believed Moaca was going to have her foal. Andrea agreed to go to the ranch and hoped she'd find inspiration for a song. At the farm Andrea found it hard to adapt so she tried to write a song instead of doing "country work". Bees chased her into Moaca's stable who was unimpressed to see her. Mia's Grandmother then asked the girls to do chores, and Andrea helped collect eggs. Martin's father was furious when Olivia drove the tractor into the side of the ranch, and demanded the girls have to pay the costs to fix it. Andrea suggested the girls raise the money to fix the ranch by making a lemonade stand, which the girls agree. Andrea helped make and sell the lemonade at the market. When it's time to give birth to Moaca's foal Andrea helped in the delivery. Andrea then started singing the song she wrote. In Emma's Dilemma Andrea was at the beach with her friends. Andrea talked with them about how they were going to enter the float competition to celebrate Heartlake City's 200th party. Later the friends met at the juice bar and discussed their ideas for the float, but they didn't listen to Emma. When the girls went to Stephanie's beach house to build the float, Emma did not join them and instead she helped the girl's rival Tanya and her friends. Andrea worked twice as hard on the float as she knew Emma is not there to help. After building the float Andrea was underwhelmed at the size of it, nevertheless the girls brought the float to the competition. When the rival teams saw Jacob and his friend's float they were shocked by the size of it. Emma convinced the teams the only way they can win is if they work together. Andrea helped put the two floats together, and durning the parade she came out of it and sings. Andrea is overjoyed when the combined team won first prize. In the next episode Andrea was helping Olivia's aunt Sophie pick out a bridal gown. Olivia told her friends that Sophie's future groom, Henry has gone missing in the jungle. Olivia decided not to tell Sophie as it would worry her. Mia and Stephanie decided they would accompany Olivia to the jungle, while Emma and Andrea stayed with Sophie and stall her. Andrea and Emma took Sophie to the spa, but Sophie became suspicious and they told her what's happening. The three of them went to the jungle and bumped into Mia, Olivia and Stephanie. Andrea and Emma apologised for telling Sophie but they're forgiven by the others. When the friends rescued Bamboo, Sophie took him back to base camp, leaving the girls alone. The girls wandered around the jungle and Andrea discovered a chameleon who she names Tony. Andrea asked Tony to give them directions to Demon Falls and he does. When Henry is not there Olivia realised Henry probably went to diamond falls not demon falls, to look for a diamond for the wedding. Olivia was right, and Henry was there. Henry was stuck behind a waterfall with a baby tiger named Flame. Andrea helped Olivia stop the waterfall with a dam and reunited Flame with its mother. Henry and Sophie were also reunited and Andrea adopted Tony. When the friends returned to Heartlake City Andrea sang at Henry's and Sophie's wedding. The seventh episode is the first episode to be centred around Andrea. The girls were in Emma's bedroom chatting. Andrea revealed that the pop superstar, Livi is a judge in a talent contest and the girls all signed up. Andrea fantasised about what fame she'll receive if she won the show. The girls arranged a meeting the next day to practice for the show, but, Andrea didn't attend and instead worried about her outfit. After her friends practice, she met the girls and went shopping for an outfit at the mall. At the show Andrea and her friends gasped when they saw Livi and are excited for the show. After all her friends are booted out of the competition, Andrea was nervous before her audition. Half way through her song she forgot her lyrics and Livi buzzed her out. The other judges put Andrea through to the final round, but Livi only accepted after Andrea promised to practice. All of her best friends were overjoyed for her but Andrea believed she's blown her chance. Andrea practiced by herself on a jog, but kept seeing Livi saying to her "You didn't practice". When Mia and Stephanie chased after Andrea, Andrea told them to leave her alone as they can't help as they were removed from the competition. Andrea regretted saying that, especially at the competition when she saw how great Tanya's performance was with her friends. When Andrea started her performance, she was nervous, but her friends saved the performance when they added lights and themselves serving as background dancers. When Mr. Mayor announced the winner, Andrea and the girls ran off as Andrea didn't want to be famous as she'd miss her friends too much. In the eight episode, Olivia convinced Andrea and her best friends to join her on a school science trip to Kate's island. On the boat the girls came across the mysterious Kate. Ms. Stevens split to students up in to two teams, Andrea was with her best friends and Kate. Reluctantly, Andrea helped her friends looked through various rocks. The friends returned to their dorms and Andrea helped Olivia study the rocks. Andrea tried to befriend Kate by admitting she's not to found of science herself, but Kate ignored her. Olivia told the friends in a hot air ballon, when she woke up in the middle of the night and saw Kate and Mia return. The friends discussed Mia and they agreed she was acted suspiciously. The friends eventually figured out that Mia and Kate where sneaking out to a large "X" in the island, as it matched Kate's medallion. The four friends snuck out that night and followed Mia and Kate, Andrea was slightly scared, as Emma convinced her wild animals would attack them. When they found Kate and Mia they confronted them. Kate revealed that she thought her medallion belonged to Dark Eyed Kate. Olivia realized that the "X" was a secret hideout of Dark Eyed Kate, as her crew members based its location off the constilaton The Seven Sisters. The friends pushed the cave open and found a rare fossil. The friends are delighted and their classmates enjoyed their rock presentation. Andrea befriended Kate and Olivia invited her to sit with them at lunch. In the following episode, Andrea invited all her best friends to visit the Grand Hotel, which her family bought. Her aunt and the manager, Susan had to leave as her daughter was injured in a skiing accident. The girls volunteered to mind the hotel when Susan was gone. Susan agreed as she believed there would not be many guests that weekend. When multiple new guests came, Stephanie called a staff meeting. Andrea volunteered to drive the hotel taxi. When Andrea returned, she was embarrassed when she discovered Grandma Jean was telling stories about her as a child. Andrea decided she would change clothes and entertain the guests as they ate, as nobody wanted a ride in the taxi. Stephanie disagreed and brought Andrea into the kitchen, so she could help with the cooking. Andrea kept sneaking out to try and sing, but kept being dragged back into the kitchen by Stephanie. Eventually, all the guests left because of the slow service and chaos. An elderly lady came and asked could she have a seat, the friends were shocked that someone still wanted to eat at the hotel. Grandma Jean told the girls that they work best together and told them about the time she first met them, when they made her pancakes. The girls decided they would make the elderly lady pancakes for her meal. Andrea sang to the woman while she waited for her meal. The elderly lady invited them to sit with her and the friends told her many stories. After the elderly woman left, the girls started to clean up the hotel and by morning they were finished. When Susan returned, she was delighted to find out the hotel was given a five star review, by the elderly woman who turned out to be a hotel critic. Olivia drives the player (who's her in game cousin) to Main Street and Andrea greets her. Andrea brings the player to her rehearsal studio, where Andrea practices for her performance. Later the player helps Andrea work in the city park café. After Andrea's job is finished, she can begin her performance, which her friends and the player are a part of. When the performance is finished the six go the fair and the player wins a giant plush bunny for Andrea. At the end of Emma's story Andrea partakes in the fashion show. Ar the end of Stephanie's story, Andrea goes on the Dolphin Cruise for a beach party. At the end of all the stories, Olivia gives the player directions to her Treehouse where Andrea and the friends welcome her to the friends club. Andrea appears in thirty-nine of the fifty Friends webisodes. In "Bored Beach Blues", Andrea met Emma at the beach, Emma could not hang out with Andrea as she was on lifeguard duty. Andrea sat on a blow up bed, closed her eyes and sang her "bored beach blues". Unknowingly to her, she got brought out to sea. Andrea was about to get hit by a cruise ship but Emma saved her. When Andrea is brought back to shore, she was unaware of what happened. She was disappointed because she thought that Emma went swimming without her. Andrea singing in "Working at the juice bar"
She makes her second appearance in "Working at the juice bar". It depicts Andrea's first day working at the juice bar. Naya handed Andrea some fruit to put in the fridge, but Andrea accidentally put the fruit in the freezer. Stephanie ordered a pink power, so Andrea makes it while singing the recipe. When Alan's bus was broken down he came in and asked for 14 drinks. Naya opened the fridge and asked Andrea what she did with the fruit. Andrea showed her what she did. Naya was about to tell Alan she has no fruit left, but Andrea got an idea. Andrea cut the frozen fruit and blended it (nicknamed slush ice). Alan loved the drink and ordered 13 more. Andrea has a very minor appearance in the third episode she appears in, Quit Monkeying Around. When Juliet went missing Andrea was ordered by Stephanie to go look for her in a certain direction, and she obeyed. When Emma found Juliet the five girls and Matthew sat around the campfire with the animals they rescued. The fourth episode Andrea appears in is called All We Need Is Juice. 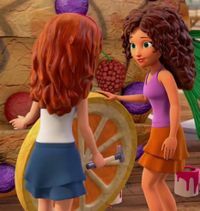 Stephanie was throwing a beach party and sent Andrea, Mia, and Olivia to bring juice for the party, which she did after they collected the fruit in the Sunshine Ranch. Andrea had a great time at the party. The fifth episode she appears in is called Speaking Of Parrots. Stephanie asked Andrea what her favourite animal is and Andrea said the bird of paradise, but Stephanie tells Andrea that's a flower but Andrea didn't mind. Ms. Stevens assigned the class projects on animals and Andrea was assigned a project on penguins. The sixth episode she appears in is Nice Prank. Andrea, Emma, Mia, and Stephanie play a prank on Olivia. Each of the friends dress up as Olivia and all of them took a turn pretending to be her, and recorded it on Olivia's camera. The girls were shocked when Olivia returned and then asked to see the video. After watching the video, Olivia revealed that she planned for this all a long and was secretly pranking them. The girls bickering in "Drawn Together"
In the seventh episode she stars in, Drawn Together. The friends complained as in their living space is crowded. Henry then told the girls that he's building a new area for the jungle, Andrea wanted a bird house. The other girls did not agree, they each had different ideas They all drew a sketch of their ideas and placed it on the board for Henry. Henry decided that all of their ideas work best together, as a sanctuary. The episode ends with the sanctuary built and the girls reunited as friends. The eight episode she appears in is called Noisy Camping Trip. Andrea, Joanna and Olivia head out on a camping trip for their project on nocturnal animals, they find a spot in close the woods. The girls hide behind the bushes in hopes an animal will appear. Whenever an animal came close, Andrea was too loud and it ran away. Olivia suggested to Andrea that she could make a campfire. Andrea tried to make popcorn but it exploded into the air. Luckily for the girls, the popcorn attracted bats and they managed to take pictures of the bats enjoying their popcorn. The ninth episode Andrea stars in is Jungle Cupcakes. To get away from the mosquitoes who are eating her and her friends, Stephanie decides to bake cupcakes. When there is no baking ingredients they use other substances instead. When given a cupcake Andrea digs in, but is extremely dissatisfied with the horrible taste. To the girls's pleasure the mosquitoes start eating the cupcakes instead of them. The tenth episode Andrea stars in is What's at Heart?. The episode starts with the friends trying to find a picture for the schools newspaper. Andrea spotted what appeared to be an unicorn in a photo, Olivia claimed that the picture isn't real news or fact. After the friends published the story anyway, Emma told the girls they're being featured on Heartlake News about the story. 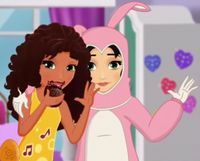 Before they are featured on the show and Mia gave the girls an invite to Blaize's birthday party. The girls were terrified when Blaize turned out to be the unicorn. When the girls were featured on the news, Andrea saved them by showing the invite to Blaize's party claiming the unicorn was found. The girls walked away and thanked Andrea for the save. The eleventh episode Andrea appears in is named Two Jacobs. Olivia started talking about Jacob and how she said goodbye to him at the train station, Mia said that's impossible as she saw Jacob in the mall fifteen minutes ago. Emma decided to get to the bottom of this and took photos of "Jacob. ", for Olivia. Emma and Andrea go around the shopping mall taking photo of Jacob. Emma gave Olivia the photos, Olivia stated the pictures of "Jacob" are not Jacob and in fact someone else. "Jacob" introduced himself as Julian and said he has a cousin called Jacob and sometimes people get them confused. Emma and Andrea sneaked out and said they're going to hide in the mall while shopping in the summer sale, which caused the other four to laugh. The picnic in "I Heart Card You"
The twelfth episode Andrea appears in is called "I Heart Card You". Emma invented the heart card, and planned to invite Andrea and the other friends to the park by giving them all one. All of Emma's test-cards flew out of her window and they ended up around the city. Andrea and the rest of the girls showed Emma the heart cards and told her how everyone, including them, loved them. Emma was not bothered by this and sent the girls another heart card and the episode ended with them enjoying a picnic. The thirteenth and fourteenth episodes she stars in are called "Emma is Moving" (part 1) (part 2). Andrea and Mia were upset when they overheard Emma's parents (Charlotte and Luis) say that they're moving. Andrea and the girls decided to throw Emma a surprise slumber party and decorated her room with heart cards. Emma loved the surprise and thanked the girls. The girls were delighted when it is revealed Emma only moved a few houses up to her new home. The girls bought Emma house warming gifts, which Emma adored. In "What an Interesting Ice Cream", Mia made a new cherry-flavour ice cream, which the girls tried and hated. To avoid disappointing Mia, as the girls knew no one would buy that flavour of ice cream, Andrea and the girls tried to buy all the ice cream. Mia refused, so the girls wore different disguises so Mia would sell it to them. When Mia figured out, she treated the girls with a chocolate ice cream, as they tried not to disappoint her. In "Big Dreams" Andrea danced and sang in her bedroom with her best friends and Tony. During the time she danced, she imagined singing with Livi. "Valentines Whaaat?" is the seventeenth webisode Andrea appears in. The girls were shocked and angry when Andrea got a valentine card from Jacob. Olivia said that Andrea should go on the date with Jacob and she said herself and Jacob are not dating. Andrea went, but brought the girls with her to confront Jacob. Jacob revealed the card was supposed to be for Olivia and the two embarked on a date. The eighteenth episode Andrea appears in is called "Girls DON'T Snore". Luis, accused the girls of snoring. Olivia brought a tape recorder the next night to record the snoring, if there was any. Andrea sang to relax her voice, ensuring she would not to snore. When the girls played the tape recorder back, they heard snoring, but the girls said they should all forget the night and move on. In "Look High and Low", Andrea, Kate, Olivia, and Stephanie found a treasure map in the lighthouse. They asked Noah if they could use his hot air balloon and he agreed. Before she could go on the balloon Andrea ran off for an ice cream. When the girls found the location of the treasure map, the treasure turned out to be a picnic planned by Emma and Mia. The six then sat down and enjoyed their lunch together. The twentieth episode Andrea stars in is named "A Strong Voice". Stephanie lost her voice just before a speech, so Olivia rigged up the system so that Stephanie could borrow Andrea’s voice. Andrea could not help but tease Stephanie, and walked on stage singing. Stephanie used the system that made Andrea sound horrible with her hoarse voice. When she has finished pranking Andrea, the two apologised to each other and danced with Olivia on the stage. In the following episode, "The Juicy News", Stephanie wanted to find a story for the school newspaper, What's at Heart? Andrea and Stephanie were excited when Mia and Emma show them scandalous stories, but where unimpressed when the stories turned out to be about animals. In "Fool Me Once", Stephanie tripped into a bucket and Andrea laughed. The twenty-third episode Andrea makes an appearance in is called, "Emma's Design Show: Easter Letters". Andrea filmed Emma's design show. Durning the show Andrea tricked Emma into giving her an egg. The episode finished with Andrea eating her new chocolate egg. In "Making the Band", Andrea was the vocalist for her band The Heartbeats. When Matthew left the band after finding it it too girly, Andrea was upset. She was relieved when Stephanie took Matthew's part and played the guitar for the band. Andrea preferred the new group and enjoyed the practice with her four best friends. The twenty-fourth episode Andrea appears in is named "Friendship in the Air". Andrea and her five best friends threw heart cards at civilians out of a hot air balloon. In "Our Special Day", Andrea's mother told Andrea to write her a grocery list, which she did. Andrea's mother accidentally took the invitation to the movies for Mia. Andrea's mother was thrilled as she believed it was a Mother's Day present. When the other friends forgot Mother's Day too, hey all decided to invite their Mothers to the cinema and had a pizza night. In "Life of Livi", Andrea watched a documentary about Livi. In the following episode, "Bubbly Personality", The Heartbeats were opening for Livi's concert. Andrea was smoking in the bathtub in Livi's tour bus. When the bus stopped the water ran out and Andrea could not rice the bubbles out of her hair. She was not sure she could perform with her hair covered in bubbles. Olivia used a fan to make the bubbles go away so Andrea started to preform. In "A Spooky Sensation", Andrea and her friends went ghost hunting for The White Lady in the hotel. The ghost turned out to be Stephanie when she sleepwalked and sleep-ate. Andrea makes a minor appearance in "Nate Wants a Date". Andrea played the trumpet for Nate's and Stephanie's dinner. In the thirty-second episode she appears in, "Room For Practice", Andrea and her friends had to search for a new place to rehearse their band, as Mia's garage was being cleaned. After they searched, they eventually found the perfect place, which was the school office. In "Busy with Dizzy", Andrea and Emma gave animals rides on a roundabout. In "The Great Hair Day", Andrea received a free haircut from Natasha. After Andrea saw the cut, she was underwhelmed as it was to short and went out with Olivia and Stephanie (who also did not like their cuts) to buy wigs in the style of their old hair. In "Jacob sings of Love" Matthew told the girls that Jacob wrote a love song. The girls thought it was about Olivia and decided to read it, to Olivia's dismay. The girls were horrified when they found out it was about a girl named Suzie and they confronted Jacob. Jacob told the girls Suzie is his dog and he wrote it about her. Andrea then suggested to Jacob to write a love song about Olivia and rhyme her name with Bolivia. Andrea makes a minor appearance in "Not Just Baking". Andrea and Mia were paired up in home economics to bake something. Andrea kept eating what she and Mia we're baking, she was horrified when it turned out to be dog biscuits. Andrea then went around to the other students and ate their baked goods. In "Studio of Fun" Andrea and Emma were messing around with Livi's recording equipment. When Livi and Olivia catch them they are not mad and join the girls. In "Which Star Are You?" Andrea makes everyone take a quiz to see which pop star they are. Everyone but Andrea got Livi, which disappointed her. Andrea was delighted when Livi got the same person as her. In "Sleep Little Skunky" Andrea and Mia drive a stray Skunk to the woods. They try not to startle it as it will release a stench. In the end the Skunk releases it's stench anyway and Andrea refuses to wash Mia's car again. In "A Taste of Science" Andrea's class has to do a project on fossils. Andrea was more willing to buy ice cream, and she messed until she was full. After eating too much Andrea thought she found a fossil. The fossil turned out to be a souvenir. Ms. Stevens felt sorry for the girls and bought them ice cream, which Andrea was too full to eat. In "Letters of Love" Andrea reads Ms. Stevens and Chef Pierre's love letters to each other. Andrea gets the two to go on a date but they end up breaking their legs and Andrea decides not to meddle again. Favorite food: The more spice, the better. And milkshakes! I’m also good at: Dancing, singing, theater and drama, cooking, computer games. My friends think I’m sometimes: A bit of a drama queen! But I’m just the kind of person things happen to! I want to be: A musician/singer-songwriter. I would never: Miss a tune! Or miss my favorite talent show on TV. I like to hang out: At the City Park Café, on stage – performing my music! Andrea appears in the least amount of sets out of the five friends. Brickipedia has a collection of images of Andrea on Andrea/Gallery. This page was last edited on 10 February 2019, at 00:19.